Joel Fletcher is an incredibly talented stop motion animator who has worked on countless movies, commercials, video games and TV shows. But before he helped bring the characters of The Nightmare Before Christmas to life, he was creating short experimental films that today, some 20 to 30 years later, give us an entertaining view of how the world looked before the internet, ever-present cell phones and the death of the shopping mall. PEOPLE PATTERNS 1980 time-lapse from Joel Fletcher on Vimeo. The first film, People Patterns, was made in 1980 on and around the campus of the University of Wisconsin. It was shot on Kodachrome Super 8 film and consists of a series of time-lapse shots showing all sorts of regular people going about their business in awesomely 80s attire and laughable hairstyles. MALL MANIA 1990 time-lapse from Joel Fletcher on Vimeo. 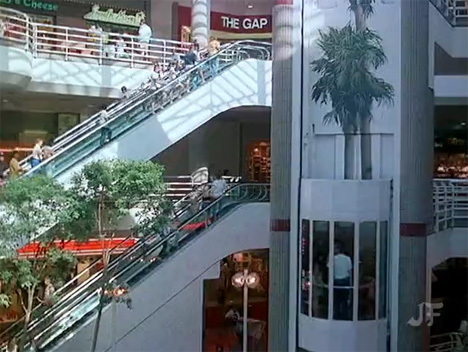 Ten years after that, Fletcher produced Mall Mania, a look at several busy Los Angeles shopping malls and the shoppers within. This short feature was shot on 16mm film and gives a rather striking and unusual view of shopping malls and how people move around in them. Both films feature some classic bits of original 80s music, so be prepared to have these electronic songs stuck in your head all day.